If you’re craving the rich and distinct flavor of oysters, no worries. West Virginia’s restaurants, from raw bars in Huntington to taverns in Lewisburg, are serving up some impressive options. Whether it’s on the half shell, fried or Rockefeller style, you’ll find something satisfying at these awesome oyster places in West Virginia. Shuckers is a surprising little place with great food and service. Located in St. Albans, this neighborhood eatery serves a great surf and turf plate, jerk shrimp, tuna steak sandwich, clam chowder, and oysters on the half shell. Best little hidden gem in the area. If you leave now, you’ll arrive just in time for the best seafood in this part of the state. Just In Time Seafood has social media all abuzz with favorites like the shrimp tacos, grilled salmon, and other seafood from soft shelled crabs to oysters to calamari and everything in between. Check out the raw bar that features clams and oysters on the half shell. Looking for a great place to take a date for a special occasion? Laury’s Restaurant in Charleston offers contemporary French-American dishes in an elegant setting. There’s a beautiful view of the river which adds to the ambience. Committed to customer satisfaction, you’ll find the staff friendly and helpful, the food satisfying, and the experience worth repeating. For a special treat, try the Oysters Rockefeller. Most people don’t imagine a place serving wood-fired pizza and grilled oysters, but Backyard Pizza & Raw Bar has to be experienced to be believed. And once you do, you’ll be back to try one of the 18 specialty pizza pies, the raw bar featuring mussels, scallops, and Ahi tuna, or the nice variety of oysters and oyster dishes like the barbecue New Orleans style oysters. Travel to Wheeling in your car to get a boat… of your favorite fish with hand-cut fries, coleslaw and your favorite drink, that is. Coleman’s Fish Market is in the historic downtown market area and has been famous for their fish sandwiches for decades upon decades. Super busy at lunch time, you can look at the photos on the wall of Wheeling in the past. Specialty seafood, like oysters, crab, salmon, pollack, whitefish, and clams can be ordered to take home, too. This is worth the visit just to see how things operate in an old-time market. Got a craving for seafood? Cooper House Grill is the place to get that satisfied. You’ll find a casual and relaxed atmosphere with inside and outside dining, and a great menu that includes items like oysters on the half shell, crab legs, salmon, lobster, tuna, and a combination platter. They have burgers and steaks for those who prefer, but the seafood here is legendary. Perfect go-togethers like oysters on the half shell and a great bloody Mary is what you’ll find at Bistro at the Barge in Charleston. Located right on the river at Trojan’s Landing, the Bistro has a diverse bar menu, seafood and steak, and a great selection of wine and cocktails in a casual setting. The Bar & Grill is great for outside dining when the weather permits and has the same great menu with live music during the week. It’s a win-win either way. What’s better than food and friends? How about food, friends, and fish? Specializing in the best seafood around, Food & Friends is known for having the best oyster po’boys around. Cozy and comfortable, you’ll find the ultimate in comfort food with a twist, like the hand-breaded fresh oysters, fried to golden perfection or the harbor crab dip that will melt in your mouth. Another Lewisburg restaurant, equally a good, is the Livery Tavern. 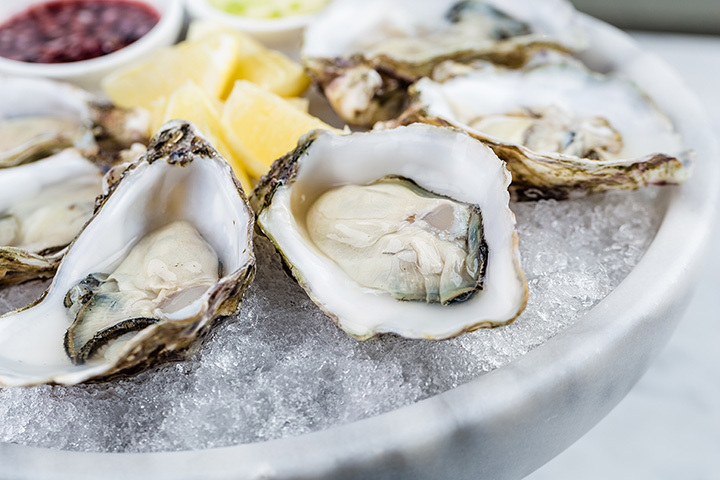 Inside this upscale cabin-style restaurant, you won’t only be overwhelmed by the cool and chic atmosphere; you’ll be overwhelmed by the spectacular sounding selection of oyster dishes on the menu! There is a zesty fried version with Bloody Mary dipping sauce, a baked version with creamy bacon, parmesan and spinach, or a raw platter with the traditional fixings. Splurge and try all three! The seafood selection here is unbeatable—ranging from Spanish Caribbean Paella with a medley of seafood, to blackened ahi tuna, there is a plethora of options. There is certainly something on the menu for everyone here. Worthy of a shout-out are the Blue Point Oysters. They are absolutely delightful, either fried or on the half shell over ice. Add lemon garlic butter and you’ll be singing about how delicious your plate is!